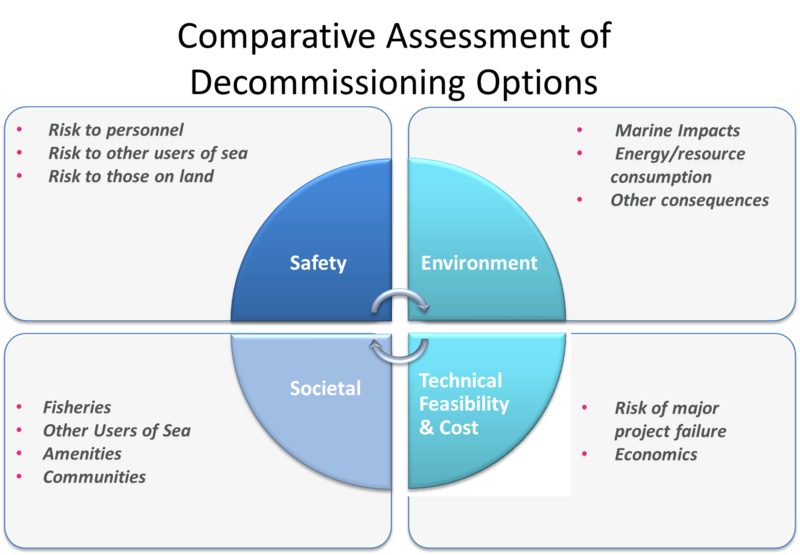 The relationship between decommissioning costs, potential environmental and societal impacts, and safety is often complicated. This is particularly true if the infrastructure of an offshore oil and gas development is not to be entirely removed. Consequently, various options need to be considered. In this situation, comparative assessment is a powerful tool that can help evaluate relevant decommissioning options against a defined set of criteria and sub-criteria. Here, we provide an introduction to comparative assessment and discuss the wide range of assessment processes and methods, ranging from qualitative, narrative-based assessments to quantitative and detailed assessments that have been adopted. Comparative assessment is a well-respected planning tool that is used across multiple industries and has been adopted by the decommissioning sector, particularly in the UK. It works by helping to narrow down the alternatives and choices for a given scenario by using a number of criteria and sub-criteria that the options are assessed against. This planning methodology allows options to be assessed and scored using a range of parameters, taking into account the full range of contributory factors including environmental, safety, technical, societal and economic. The outcome provides a clear and transparent ranking of the alternatives that is robust, while being accessible to all stakeholders and regulatory bodies. In the UK, comparative assessment is a mandatory requirement for any decommissioning activity where derogation from current legislation is required, although its value can be far greater than to ensure regulatory compliance. Unless all infrastructure is to be removed, an understanding is needed as to the relationship between potential environmental and societal impacts, safety considerations and costs. Subsequently, various options are considered. Comparative assessment is often preferred to the alternatives such as multi-criteria decision assessment due to the relative lack of complexity and the opportunity to use both quantitative and qualitative data. Because it’s scalable, comparative assessment is equally applicable to both small and large-scale projects covering a wide range of technical and environmental parameters, as well as cost. A recent example of the use of comparative assessment in the offshore sector came with the decommissioning of the Murchison platform, operated by Canadian Natural Resources International (CNRI), which was installed in 1979 and became part of an intricate framework, exporting oil onshore to Sullom Voe through a pipeline. Lying in 156m of water, the platform was supported by an eight-legged steel jacket and had topside modules for drilling, production and accommodation. Murchison was one of the biggest steel jacket platforms in the North Sea, with its topside weighing 24,500 tonnes and consisting of 26 modules. Using standard industry practice, subsea wells were plugged and abandoned. The topside modules were dismantled and brought onshore to be reused, recycled or disposed of. The weight of the jacket at 27,584 tonnes including jacket structure, piles, grout, marine growth and flooded members dictated a phased removal of the structure and made it a candidate for derogation under the Convention For The Protection Of The Marine Environment Of The North-East Atlantic (OSPAR) 98/3. To assess the most appropriate course of action, CNRI engaged BMT Cordah to provide environmental support to the decommissioning programme and facilitate the comparative assessment process. This involved five workshops, attended by all major stakeholders including engineering, environmental, health & safety, shipping & navigation and fisheries. BMT Cordah, in its role as an independent third-party with wide ranging experience in both comparative assessment and the offshore decommissioning sector, worked with CNRI to design the scoring and ranking system that was used. The attendees considered the criteria surrounding each aspect of the options and their expert professional opinion was used to score the alternatives. The culmination of a qualitative and a quantitative assessment provided the basis of the final decommissioning option. Within this particular project, the comparative assessment concluded that there was a significant increase in operational safety risk, technical complexity and cost associated with the full jacket removal compared to partial jacket removal. A partial removal was most appropriate and a derogation case was submitted to, and subsequently approved by OSPAR. The jacket footings will remain in place although the jacket will be removed to a height of approximately 44m above the sea bed and brought onshore for reuse, recycling or disposal purposes. The drill cutting piles will be left in their original location at the jacket footings, to decay naturally over a period of time. The transparency and robustness of the process made it clear to the regulator how the decision to apply for derogation had been reached and what the implications were for health & safety, shipping & navigation and fisheries in both the short and the long term. Another example of the use of comparative assessment involves 16 infield pipelines located within a designated conservation area and included in a proposed decommissioning programme in the southern North Sea. The operator, Conoco Phillips, had agreed to remove all the topsides, jackets and associated subsea infrastructure, but was examining whether or not it could leave the pipelines and mattresses in-situ. Conoco Phillips engaged BMT Cordah to carry out a comparative assessment for decommissioning the pipelines in situ to help determine the preferred option for this and future decommissioning programmes. The comparative assessment concluded that decommissioning with minimum intervention was most appropriate. Mattresses would remain in situ, cut pipeline ends to have rock-placement, with no additional rock-placement along the pipeline length. In this situation, full removal was deemed least appropriate. * Evaluation criteria or options are ‘soft’ and require judgements calls typically where data is not available. * Criteria are described inadequately, leading to inconsistent use and interpretation. * Criteria are used that do not differentiate the options and are irrelevant to the decision being made. * The focus is erroneously placed on the method rather than the outcomes and consequences of the different options. * The assessment is overcomplicated, including too many or irrelevant options. * There is inadequate technical knowledge of the options and their differentiators. The use of comparative assessment in decommissioning programmes can deliver easily accessible, robust findings to comply with the regulatory framework or to help deliver best practice. Its scalable nature means that operators can take an incremental approach to comparative assessment and start with the most simple and qualitative approach, moving only to the more complex and quantitative methods if it is deemed necessary. 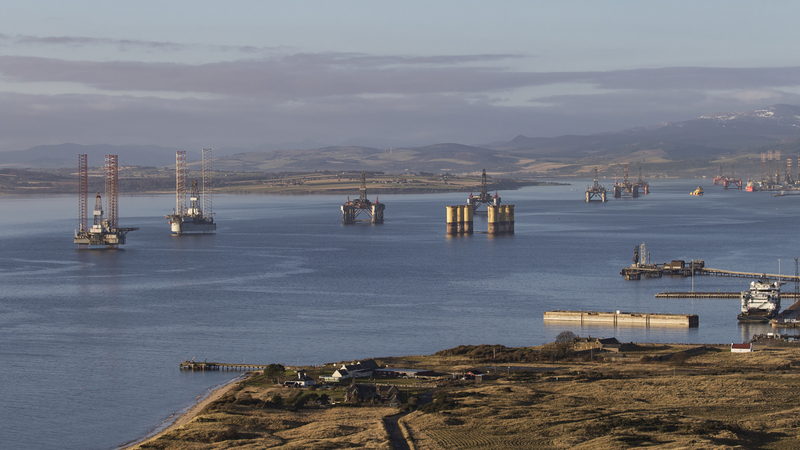 With expenditure on decommissioning in the North Sea alone expected to exceed £35billion over the next 25 years, the delivery of comparative assessment will be a key part of the mix. An industry project is being launched that will develop offshore safety case guidance and technology solutions to reduce OPEX spend during late life and decommissioning phases. ABB in collaboration with Industry Technology Facilitator (ITF) is launching the project, which will bring together operators, legislators, industry bodies and consultants to address cost-efficient management of major accident hazards (MAHs) and safety and environmental critical elements (SECEs). 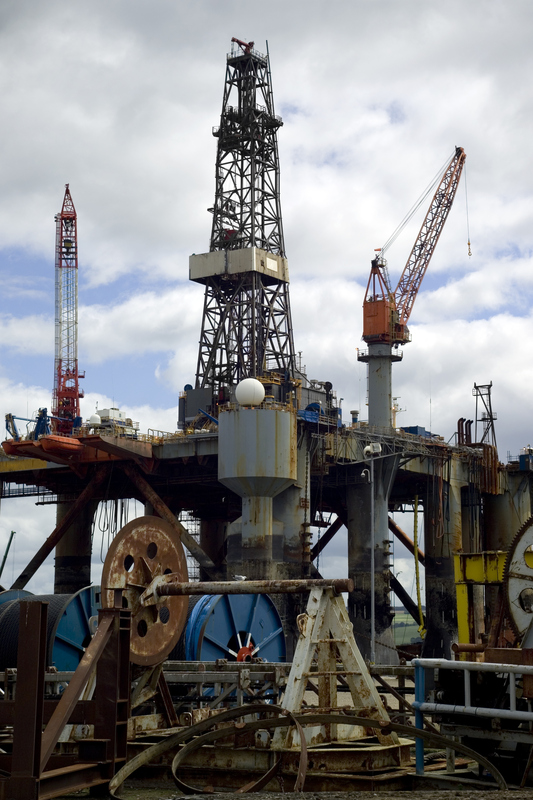 For offshore structures in the UK Continental Shelf (UKCS), there is a legislative requirement to maintain a safety case throughout the operations, late life and decommissioning phases, until completion of the agreed decommissioning scope of works. The industry project will develop guidance that will support operators manage their offshore safety case in the planning of decommissioning and enable technology opportunities to be developed that will reduce OPEX spend in late life and decommissioning. There are three primary aims of the project. The first is to develop industry guidance on end of life (EoL) major accident hazard management (MAHM) and offshore safety cases to supplement existing regulator guidance and facilitate EoL safety case submissions and operations. The second aim is to define key systems, services and safety critical elements that can safely be retired during late life and decommissioning. Finally, the third goal is to provide a platform for small and medium enterprises to showcase technology solutions that support the industry’s target to reduce decommissioning costs by 35% to 50%. ABB will provide structure, funding, project management, technical safety guidance and facilitate the capturing of knowledge.